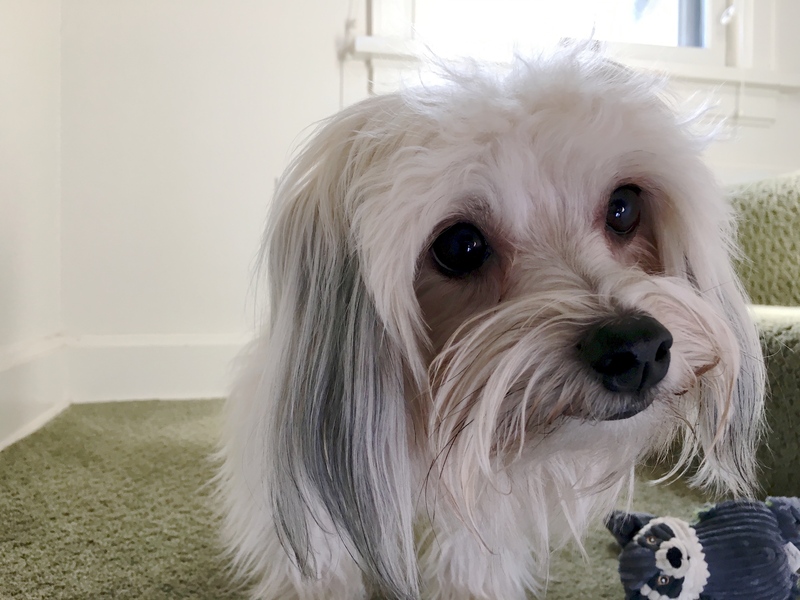 Leo is a two-year-old Havanese male who likes to barks at guests and visitors to his guardian’s studio. I sat down with Leo’s guardians discuss his day-to-day life and found out that he really didn’t have any rules. Dogs go through life probing to test boundaries and limits. If we don’t have any rules in place for the dog then we really don’t practice correcting are disagreeing with the dog very often. Often times this results in the dog getting the perception that they must be the authority figure. This was clearly the case with Leo. In order to stop him from barking and reacting to guests it will be important that Leo start to see and identify himself as being in a follower position. The best way to make this happen is for the humans to assume a leadership role in the dogs eyes. Because Leo’s guardians said that he obeyed them when he felt like it I started out with a simple recall exercise so that I could show his family how to condition him to recall on command. One thing I neglected to include in the video was how to respond if Leo comes to a person who did not call him during the exercise. My preferred way to handle the situation is to cross my arms across my chest then tilt my head up into the right or left. I hold this position and ignore the dog completely until it moves away. I suggested that Leo’s guardians practice this exercise daily with three or more people forming a circle in the living room. Once the dog starts responding right away every time anyone calls him, the next step is to have the members of the circle move further away from one another. At first everyone should be in the same room, but as his responsiveness improves they can start having a member go into other rooms so that Leo has to find them beyond his line of sight. By gradually increasing the distance that Leo has to cross to go to whoever called him, we can help him get better at this recall skill. Once we always consistently recalling to whoever calls him no matter where they are in the home, the next step is to practice this exercise outside. Are considerably more distractions outside then there are are inside the home. Just like inside the home, three or more people would stand in a circle about 10 feet apart taking turns calling Leo one at a time. As he gets better at it they can step backwards increasing the size of the circle until Leo consistently recalls to whoever called him no matter where they are in the yard. Leo’s guardians had gotten into the habit of repeating commands multiple times and speaking to the dog in complete sentences as if he spoke English. But in reality dogs hear the sound of words, not the words themselves. Therefore it’s not necessary for us to conjugate or ad verbs such as “go potty” etc. Also if we are going to repeat a command over and over and over there’s no reason for the dog to respond. For this reason I suggested that they start to only give the dog a command one time and then either move away or use a different motion or movement to get the dog to comply. A good example of this would be asking the dog to recall. I give the come command one time. If the dog does not come then I make a loud kissing sound and as soon as the dog looks my way I start lowering my hand with the tree towards the floor. The lower the tree goes the more enticing it becomes for the dog. As soon as the dog comes over that I raise my hand to put him into a set and then reward him for recalling by giving him a treat and repeating the recall command. Much of dog communication is conveyed through body language and movement. To help Leo’s guardians communicate with him more effectively I went over The sound I used to disagree with the dog when it engages in unwanted actions or behaviors as well as the escalating consequences I apply when the sound does not work. I want to show Leo’s guardian how she could use these nonverbal communication cues to disagree with his over barking and excited behavior when ever anyone arrived at the door, or in her case the studio. We started the session at Leo’s home and so I had his guardian ask a neighbor if they would knock on the door so that I could show her how to claim the area. By calmly and confidently claiming the area around the door from the dog and then breaking down the ritual of opening the door into individual steps, Leo quickly adopted a follower role. I had the neighbor return a few minutes later so that Leo’s primary guardian could conduct the exercise herself. I suggested that the guardians call or text each other before they arrive at the home so that they can practice the store answering ritual themselves. This is one of my favorite exercises to teach because dogs usually have such a quick response to it. Leo was no exception. Before we headed out to Leo’s guardians studio to practice adopting new behavior there, I suggested a few simple rules that will also help the dog start to see the humans as having more authority than he does. One of these rules is to make the French are off-limits for 30 days. For dogs there a status that comes from the height at which they sit amongst their peers. By allowing the dog to sit on the couch next to them is guardians were communicating that they were equals in authority. Making matters worse Leo likes to get up on the back of the couch to sit in a perch that is higher then the position that humans in the home sat at. By blocking Leo’s access to this position of status, they can help the dog see a literal distinction between his authority and their own. At the end of the 30 days then Leo can get back up on the furniture, but only with the guardians invitation and permission. And he can only remain there while he is exhibiting good behavior. If Leo were to start to bark or engage in any other unwanted behavior activity, the guardians need to immediately ask him to get down off of the furniture. I consistently applying this consequence they can help condition the dog to assume more of the follower position. Before we headed out to the studio I wanted to show Leo’s guardian how to feed him in a more structured way. Fortunately she did not leave food out all the time. This is called free feeding and can often develop unwanted behaviors. Ever there were some things that Leo’s guardian can do to help reinforce the leader follower dynamic that she is looking for. One of these is to make sure that the dog always eats after the humans. When dogs live together they eat in the order of the rank. The leader eats first and all the other dogs stay a good 7 to 10 feet away. I had Leo’s guardian place food in his bowl on the floor and then she made the hissing sound as soon as he started to approach it. Once Leo stopped and no longer challenged for his food she pulled out a bag of chips and walk to the opposite side of the kitchen to lean against the counter and snack on a few chips. By eating in front of the dog this way and making it restrain itself rather than eating the food that is inside of his bowl, we can help the dog learn to practice self-control, while also redefining the leader follower dynamic. Once she finished snacking on a few chips, Leo’s guardian walked over and gave him permission to eat. Leo remained several feet away from the ball and she started to encourage him to come over. I had her stop and we both walked into the adjoining dining room. Again over encouraging a dog to do something it should you want it’s own can shift the leadership role into the dogs favor. After we sat down Leo wandered over to his bowl, sniffed it, then moved away without eating anything. As soon as he did this I had his guardian go over to his bowl and dump it into the food bag. Each time that she does this Leah will not be given any additional food until the next meal time. By controlling Leo’s access to food this way, is guardians can help him see and identify as being in the follower position every time they feed him. We changed up locations so I could work with Leo at his guardian’s studio. Because of all the work we had done at his home, Leo’s barking and responsiveness to visitors to the studio were almost non existent. We had a few people drop by, even running into he studio telling, but Leo stayed calm and quiet. By changing the leader follower dynamic and Leo’s guardian taking over security, Leo quickly took the follower role. But by the end of the session at the studio, Leo was looking to his guardian for guidance and no longer reacting or over barking. Because he has been barking at guests and visitors for years, it will take a consistent rebuttal and correction by his guardian to completely curtail this unwanted behavior. By petting with a purpose and enforcing simple rules and boundaries his guardians will help the dog see and identify as being the follower in the group and leave the security to the humans for good.